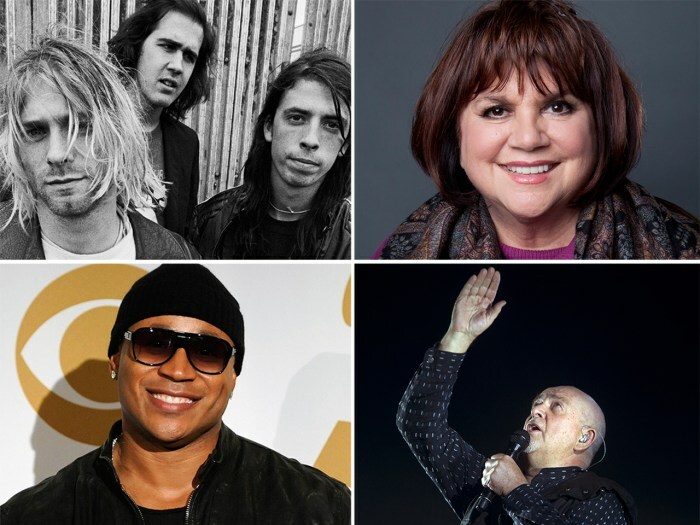 Nirvana, Linda Ronstadt, LL Cool J and Peter Gabriel are on a ballot for induction into the Rock Hall of fame, and fans will also have a say in choosing who gets in. Alternative rock band Nirvana, singers Linda Ronstadt and Cat Stevens, and pop duo Hall and Oates led nominees for the Rock and Roll Hall of Fame's 2014 class, the foundation that runs the music museum said on Wednesday. It will be the first year of eligibility for Nirvana, which helped usher in the grunge rock era of the early and mid-1990s characterized by its fusion of heavy metal with punk rock. Other nominees include U.S. rock groups Kiss, alternative pioneers the Replacements and early rock guitarist Link Wray, along with British rock bands Yes, Deep Purple and the Zombies, the Rock and Roll Hall of Fame Foundation said in a statement. Stevens, a Briton, now performs under the name Yusuf Islam. British singer-songwriter Peter Gabriel, who was inducted into the Hall of Fame in 2009 as a member of the rock group Genesis, also earned a nod for his solo work. American rapper LL Cool J and gangster rap pioneers N.W.A., which helped launch the solo careers of rapper-producer Dr. Dre and rappers Ice Cube and Easy-E, were the only hip-hop artists to garner nominations. U.S. disco band Chic, funk band the Meters and the Paul Butterfield Blues Band also received nominations for the second consecutive year. Candidates for the Rock and Roll Hall of Fame and Museum — based in Cleveland, Ohio — must have released their debut album or single at least 25 years before 2012 to be eligible. For the second year, the Hall of Fame will allow fans to vote on which artists and groups will be inducted at rockhall.com/vote and other websites. Fans have until Dec. 10 to pick their favorites. Inductees will be announced shortly after the voting closes and will also be chosen by some 600 members of the foundation, which includes past inductees. Last year's inductees included late disco queen Donna Summer, hip-hop group Public Enemy, singer-songwriter Randy Newman and rock group Heart.